Do you live or undertake works on the banks of a waterway? If you do, NSW DPI has released two new brochures to help you comply with the laws aimed at protecting our native fish and their habitat. 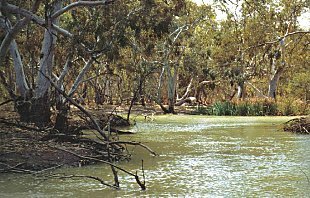 Rivers and other natural waterways are vital habitat for a range of species including fish, shellfish, frogs, platypus and water birds. They are also an important part of our way of life, providing water for livestock and domestic use, and supporting industries such as tourism, recreational and commercial fishing and aquaculture. However these habitats are under pressure from further development, increasing demand for water use, and inappropriate land management practices. Combined these have resulted in loss of aquatic habitat, sedimentation, erosion and other water pollution issues. Everyone has a role to play in ensuring our waterways and estuaries continue to be healthy and productive for future generations. The new brochures outline ways to manage important fish habitats including riverbank and in-stream vegetation and snags (large woody debris) in freshwater waterways and saltmarsh, mangrove and seagrass habitats on the coast. They also identify the sorts of works which require approvals before they are implemented. The brochures include information on recent changes to the Fisheries Management Act 1994 and associated regulations affecting riverbank works, including dredging activities and the removal of these key fish habitats. The new laws also restrict livestock access into sensitive coastal wetlands on public land. To find out more and get some useful tips to help you to look after your riverbank and to comply with current laws aimed at protecting our fisheries and their habitat, download the new brochures (below). If you would like a hard copy of the brochures, please contact (02) 6626 1269.